The Questa area has shown evidence of habitation from as early as the Paleo-Indian Clovis, then Folsom people. Around 5000 BC, as temperatures warmed, permanent settlements seem to have moved into our area following the movements of big game. Since then, however, the region lacked permanent settlements for many centuries, though the area remained a crossroads for hunting and trading between the Native Pueblo people (as the later Spanish speakers referred to them) to the south and the Plains nations to our north and east. Francisco Vasquez de Coronado may have been the first Spanish visitor to the area, traveling through here in 1540. In 1592 or 1593, more Spanish came through, following rumors of gold. Reports tell us that many did not survive. The next century saw turmoil as newcomers attempted to settle in areas already important to Native Americans, and wealthier newcomers enslaved Natives to work in diverse roles, including as miners. This continued until the Pueblo Revolt of 1680 which cast the Spanish out of New Mexico. The Spanish soon returned in even greater numbers, and the Indian wars continued. Around 1800, the Spanish militia came north with settlers and established a secure enough (relatively speaking) atmosphere, and a few tentative settlements were founded in this area. Hispanic settlers from Taos began moving north seeking new grazing land for sheep and goats. By then some French trappers had found the region, and the first U.S. military explorations were also taking place. Although settlements in this location were documented several different times in the early 1800s, new residents were vulnerable to deadly conflict for generations. Several times, all residents abandoned the area. New settlers in a region this remote seem to have little attachment to the country they belonged to, beyond the simple desire for official protection from Indian conflict. The settling of Questa fell under three different nationalities. The first land grant from the King of Spain was issued in the area in 1815 during the Mexican War of Independence (1810 to 1821). In 1846, the U.S. declared war on Mexico. New Mexico became a U.S. territory in 1850. 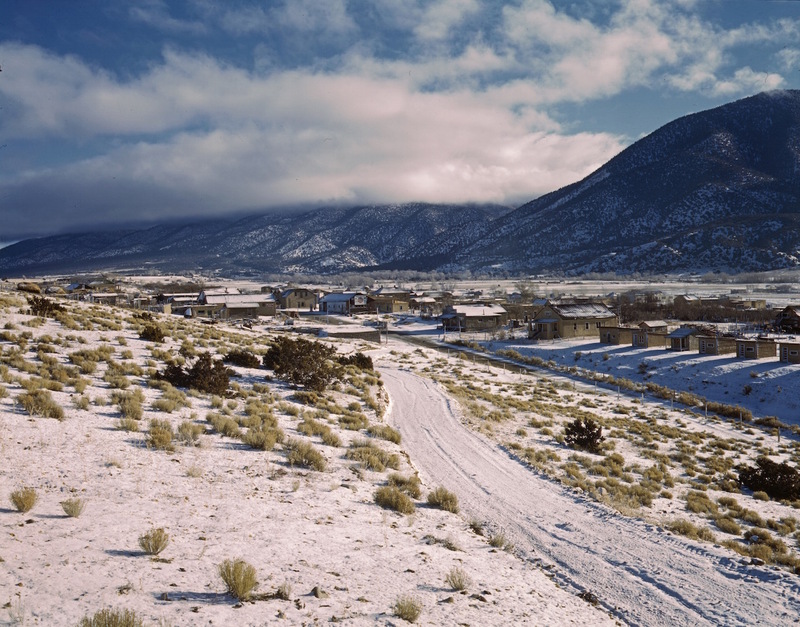 The San Antonio del Rio Colorado land grant (basically the land that is now the village of Questa) was initially requested from what was at the time Mexico, in 1841. Questa was not officially founded until 1842. This was in a period after the Mexican revolution, and after the Spanish had pulled out of the area, taking their military and priests with them, and just prior to the area falling under U.S. claim. *See our trail signs #4 and #6 for more insight into how residents held their faith. Who came here, to Questa? While predominantly Hispanic, a sampling of names of some of Questa’s historic families illustrates the multi-national origins of the settlers. These included French, German, Spanish, as well as possibly Conversos/crypto-Jews (more info HERE). Some of the earliest family names in Questa were: Rael, Cisneros, Ortiz, Armenta, LaForet, Kronig, Cruz, Beubien, Vigil, Trujillo, and Gallegos, to name a few. Local oral history tells us of many Native family members as well. Let us know what you’ve heard about your family’s roots in Questa by contacting our team, and/or taking part in our related Oral History project at the Questa Stories website, HERE. A wall built around the historic plaza area offered some protection to the fledgling settlement of sheep farmers and traders, and allowed for a stability the original populations had not enjoyed. 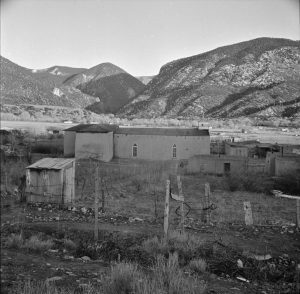 While the wall is no longer in evidence, Questa’s thick-walled adobe church has stood at the center of the original plaza since the mid-1800s. Find more information on Trail sign #4. The close of the 19th century saw an end to the Indian wars. In the early 1900s, the molybdenum mine, now owned by Chevron, was founded and became an important employer in the area. Find more information about Questa mining on Trail sign #8. The arrival of the railroad just to our north, over the Colorado border, had begun to end the long-term trade and barter economy, as more mass manufactured goods became available in the region. Questa weathered the Great Depression with the aid of the WPA that employed Questeños to build the Red River Fish Hatchery to our south and an elementary school, La Cienega School, on the east side of the village. Traditional sheep herds have mostly been replaced by small herds of cattle. Alfalfa, hay, and winter wheat are still grown, and some grain and even cattle are certified to supply a growing market for organic goods. Many of the same families who built this town continue to lead the village of Questa. Find a timeline of Questa History here. The New Mexico Office of the State Historian has an online excerpt from “Another Time in This Place: Historia, Cultura y Vida en Questa” by Tessa Rael y Ortega and Judith Cuddihy (2003). This out-of-print book is a thoroughly researched, detailed, very readable story of Questa that encompasses everything from archeological records to oral histories.